Austin Gay Men’s social and support group. Prime Timers meets monthly on the second Sunday. Many other social events are also scheduled throughout the month. The Coalition in combination with Austin Prime Timers sponsors a monthly discussion group called The Rainbow Forum. Topics are selected by the group. The idea of the discussion group is patterned after a similar one associated with the Ft Lauderdale LGBTQ community center. The Austin group meets in the afternoon on the first Sunday of each month and has a volunteer moderator each month who provides material in advance on the topic chosen. For information on meeting topics and the location each month rsvp to forumaustin@gmail.com. Here’s the link to a webpage which includes the Ride Guide and the Aging Services Council Fact Sheet. This link is on the Aging Services Council website. the Aging Services Council publishes a guide for caregivers to help them navigate through the resources available. Thanks to the generous support of the Hammill Foundation, the new caregiver guides are here. The Area Agency on Aging of the Capital Area (AAACAP), a division within the Capital Area Council of Governments (CAPCOG), provides quality services to support the health, safety, and well-being of older individuals in the 10-county Capital Area. AAACAP contracts with other agencies to ensure the availability of services such as transportation, nutrition, homemaker and senior center operations. In addition, it directly provides Referral and Assistance services, through the system of Access and Assistance program, Benefits Counseling, Long-term care and Assisted Living Facilities Ombudsman services, Care Coordination and Information. The area agency also provides services to caregivers under the National Family Caregiver Support Program. with the complexities of finding services. that it is VERY difficult to find them. AAA of the Capital Area will assist. The City of Austin has released a new comprehensive map of housing for low- and middle-income residents. The digital map, known as the Affordable Housing Listing, shows an array of income-restricted housing units subsidized or incentivized by the city. of the Austin LGBT Coalition on Aging. Their website contains a rich list of referrals and links to services. Teresa Sansone Ferguson has been an immense help to the ALGBTCOA. Click on the logo below to go to the AustinUp site. AustinUP is a community alliance committed to making Central Texas a place where older adults live full, engaged lives. We need to retire the word retired. As long as our hearts are beating, we must engage in the world around us. Older adults are an invaluable community resource, waiting to be tapped. Our vision is to create a region that responds to aging as a dynamic rather than a stagnant force. We are all aging, all the time. And we want to make Central Texas a place that supports each of us, at every age. Because our community is changing – and it’s not just how you think. 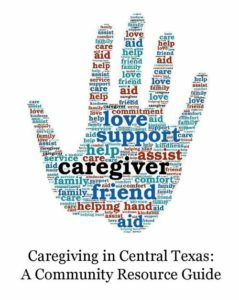 http://www.ageofcentraltx.org/caregiver.php This includes information such as Caregiver Support Groups, Legal Documents, Brain Exercise Activities, Transportation and Healthcare for seniors in Travis County, among many other resources. Gay and Lesbian elders called AGLSS. Established in 2012, AGLSS was provides aging services and resources for our LGBTQ+ community, ensuring that no one has to age alone. Through the support and foundation of the Bettie Naylor fund, these services are extended to the economically challenged as well. AGLSS, incorporated throughout our entire mission, is here to help you find the best care solution for your family, including benefits and insurance processing. The loss of a companion animal is hard for everybody. It can be especially hard for older people for whom their pet has been their sole companion. Here are links to websites called The Association for Pet Loss and Bereavement and the Joy Session Network for information and support in mourning a beloved pet.